Bordeaux loves to create new appellations and classifications. The Bordeaux wine region is the most heavily classified wine region in France. Bordeaux also has the most appellations of any wine region in the world with 60 separate, distinct, unique appellations. The appellation system is good in practice, even if there are perhaps too many regions to keep track of. After all, it is the uniqueness of the region that comes from the Terroir and Soil, coupled with the efforts of the vineyard management and decisions made during the wine making and aging process that give each wine its unique, separate identity. It’s probably best to look at each of the 60 different appellations of Bordeaux by placing in similar categories. You can group the wines by either their geographical location, terroir, or by the wines they produce, which can range from red Bordeaux wine, white Bordeaux wine and sweet, white Bordeaux wine. The Medoc, also known as the Left Bank encompasses from the north to the south, St. Estephe, Pauillac, St. Julien, Margaux and the Haut Medoc. Next, you find Pessac Leognan. While those are the most famous and important appellations of Bordeaux, there are numerous other regions that produce wines worth looking at, especially for savvy wine lovers seeking value. For example in the Cotes de Bordeaux, Satellite appellations of Saint Emilion and other regions that produce red wine, sweet white wine and dry, white Bordeaux wine and of course Bordeaux Superieur wines. These smaller appellations can be arranged by the style and type of Bordeaux wine they produce, for example, red wine, sweet wine or dry white Bordeaux wine. Cadillac is a small appellation consisting of 22 communes with about 130 hectares under vine. The Cadillac appellation has a terroir of gravel, limestone, and clay soils. Cadillac produces only sweet white Bordeaux wine. While the terroir is different than you find in Sauternes, the weather, with its early morning, dense fog and warm, sun filled afternoons is perfect for the development of botrytis, also known as Noble Rot. Look for wines from Chateau Reynon, Chateau Laubes, Chateau La Croix Bouey, Chateau Les Bertrande and Chateau Suau. Cadillac Cotes de Bordeaux was created in 1973. Prior to that date, the Cadillac region was a part of the Premieres Cotes de Bordeaux appellation. This region is not the same as Cadillac, which only allows for the production of sweet, white wine. In the Cadillac Cotes de Bordeaux, only red wine is produced. The appellation is fairly large, with 2,400 hectares of vines, spread among 39 different villages. Cadillac Cotes de Bordeaux is a long, narrow shaped region that is almost 5 miles wide and close to 40 miles long. Roughly, 220 different growers are active in the appellation. Situated on the Right Bank of the Garonne river, the terroir is limestone and gravel on elevated slopes. You find clay on the plateau with sand at the bottom of the slopes and in the flats. Part of the Right Bank, as you would expect, Merlot is the dominant grape in the Cadillac Cotes de Bordeaux, followed by Cabernet Sauvignon, Cabernet Franc and Malbec. Look for wines from Chateau Carignan, Chateau Biac, Chateau Genisson and Chateau Suau. Cerons takes its name from the Cerons River, which is the most important water source for the production of sweet, white Bordeaux, as it’s a major part of the ability to help in the development of botrytis. The Cerons appellation was created in 1936. Prior to that date, Cerons was considered to be a part of the Sauternes appellation. But the Cerons commune was removed from Sauternes to allow for the incorporation of the Fargues commune in 1921. Located just north of Barsac, Cerons is close to 200 hectares in size and has a terroir of sand, limestone and clay soils. The main part of the Cerons appellation includes 3 communes, Cerons, Illsats and Podensac. When traveling in the region, Podensac is the home of the Lillet aperitif Museum. Cerons only allows for the production of sweet, white Bordeaux wine. Dry white Bordeaux wine from the region is sold as either white Graves or generic AOC Bordeaux. Look for wines from Chateau Laroche Jaubert, Chateau de Chantegrive and Chateau Cerons. Cotes de Bordeaux St. Macaire was created as an official appellation in 1937. The region of St. Macaire takes its name from a seldom planted, dark skinned grape variety. Located just east of the Premieres Cotes de Bordeaux, the area includes 10 different communes. The small region has 64 hectares under vine with close to 50 different growers. The terroir is mostly clay and limestone soils. Roughly, 16,500 cases of wine are produced in Saint Macaire each vintage. The main grapes planted are Sauvignon Blanc, Semillon and Muscadelle. Most of the wine from Saint Macaire is sweet white wine. Those are the only wines allowed to use the appellation designation. The Cotes de Bordeaux St. Macaire appellation also produces dry white wine and a tiny amount of red wine, which are generally Merlot based. Those wines are sold as generic AOC Bordeaux. However, the best red wines from the region can be classified as Bordeaux Superieur. Look for wines from Domaine de Bouillerot, Chateau Perayne and Le Loustalet. Graves Superieurs is part of the Graves appellation. The designation is reserved for sweet, white Bordeaux wines from the Graves appellation. Created in 1936, along with the Graves appellation, which later gave birth to Pessac Leognan in 1987. Technically any wine from sweet, white Bordeaux wine from Graves or Pessac Leognan can be labeled as a Graves Superieurs, or they can be sold as a generic AOC Bordeaux wine. Look for Chateau Saint Robert, Vignobles Andre Lurton and Chateau Brondelle. Graves de Vayres was created in 1936. It’s a small sub area in the Entre Deux Mers appellation, that is not more than 30 minutes from the city of Bordeaux. The main communes that make up the appellation are Vayres and Arveyres. Even though the area has the name of Graves in its title, it is not related to the famous Graves appellation. The appellation takes its name from its gravelly soils. The region has a long history for being cultivated with grapes as the ancient Romans first planted vines when they occupied the region. Historical ruins can still be found in the appellation. The Graves de Vayres region is roughly 700 hectares in size. Graves de Vayres produces sweet white Bordeaux wine, although some dry, white Bordeaux wine is also made here. Only sweet white wines are allowed to be labeled as Graves de Vayres. Red wines and dry white Bordeaux wines are sold as generic AOC Bordeaux wine. However, the best red wines are able to be classified as Bordeaux Superieur. The red wines are all mostly Merlot based. The white wines are made primarily from Sauvignon Blanc, Semillon and Muscadelle, although growers are allowed to plant Merlot Blanc. However, Merlot Blanc is limited to no more than 30% of the final blend. Look for wines from Chateau Goudichaud, Les Fleur des Graves, Chateau Haut Gayat and Chateau Pichon Bellevue. Haut Benauge was officially created in 1955 as an appellation. The little known region consists of 9 communes. The small region is mostly used for the production of white Bordeaux wine. Haut Benauge is a part of the Entre Deux Mers appellation. The terroir varies with soils of limestone, gravel, sand and clay. Interestingly, wines from the appellation can be labeled as any of the following; Haut Benauge, Entre Deux Mers or Entre Deux Mers Haut Benauge. The best red wines are sold as Bordeaux Superieur. The remainder of the wines from the region as sold as generic AOC Bordeaux wine. Look for wines from Chateau Morlan Tulliere, Chateau de Bertin and Chateau Laubarit. Red and white Bordeaux wine are produced in the Haut-Benauge appellation. Loupiac is a sub region of the Entre Deux Mers appellation that was created in 1936. The Loupiac appellation has close to 350 hectares under vine. Almost 70 different chateaux produce wine in Loupiac. The terroir is limestone, gravel and clay soils situated not far from the Cadillac appellation and close to the right bank of the Garonne River. You can see the vineyards of Barsac that are located just across the Garonne. As the vineyards reside close to the river, with its micro-climate, the terroir is perfect for the development of botrytis, due to the morning fog and sunny, warm days. Similar to what you find in Sauternes, the vines are planted with mostly Semillon, followed by Sauvignon Blanc, Muscadelle and Sauvignon Gris. The region has old vines. For example, Dauphine Rondillon has vines that are more than 100 years old. Look for wines from Vignobles Darriet, Chateau du Cros, and Chateau Jean Fonthenille. Monbazillac was granted AOC appellation status in 1936. The appellation is a part of the Bergerac appellation. Monbazillac has a long history as it was cultivated by the religious orders in the 11th century. The terroir of Monbazillac is limestone and clay soils. The region is devoted to the production of sweet, white Bordeaux wine. The main grapes are Semillon, Sauvignon Blanc and Semillon. The terroir is perfect for the production of noble rot, better known as botrytis, due to the morning fog and sunny, warm days. However, while Monbazillac shares the ability for the development of botrytis with Sauternes, they are actually quite far from each other as Monbazillac is almost 50 kilometers away. Look for wines from Chateau Triecul, especially Chateau Triecul Cuvee Madame, Chateau Grande Maison and Chateau Clarendelle, which is made by the owners of Chateau Haut Brion. Premiers Cotes de Bordeaux was created as an appellation in 1937. The Premiers Cotes de Bordeaux region includes 39 separate different communes. Premiers Cotes de Bordeaux is not to be confused with the Cotes de Bordeaux, which also focuses on red Bordeaux and was only created in 2009. The Premiers Cotes de Bordeaux appellation has a terroir of mostly gravel, limestone, clay and sandy soils. While both red Bordeaux and white Bordeaux wine are produced in Premiers Cotes de Bordeaux, only red wines are allowed to display the name Premiers Cotes de Bordeaux on the label. White Bordeaux wines from the region are sold as generic AOC Bordeaux. The red wines are typically made from Merlot and Cabernet Franc blends you encounter in the Right Bank. Look for wine from Chateau Carignan, Chateau Lafitte, Vignobles Despagne and Chateau Lezongars. Sainte Croix du Mont is a large 500 hectare appellation with close to 350 hectares under vine, give or take. While there are about 55 growers in the Sainte Croix du Mont appellation, perhaps closer to 25 bottle and sell their own wine. The terroir is distinctive, due to the large amounts of oyster shells and fossils in the terroir, along with clay, limestone and gravel. The region is unique due its location, which offers a cliff side view that overlooks the Garonne river and its fertile Oyster beds. Situated next to Loupiac, Sainte Croix du Mont only allows for the production of sweet, white Bordeaux wine. Look for wines from Chateau La Rame, Chateau Roustit, Chateau Lousteau and Chateau Crabitan. Sainte Foy Bordeaux was created in 1937 as an official appellation. In 2017, Sainte Foy elected to become part of the Cotes de Bordeaux appellation. Located just east of the city of Bordeaux, placing it on the far eastern edge of the Bordeaux region, its borders are quite close to Bergerac. Sainte Foy Bordeaux consists of 19 different communes. The appellation of Sainte Foy has 280 hectares cultivated with vines. In total, Sainte Foy produces slightly more than 100,000 cases of wine per vintage. The Sainte Foy Bordeaux appellation is best known for the production of sweet white Bordeaux wine and dry white Bordeaux wine. However, that could be changing as starting in the 1990’s, the appellation began including red wine production. The vineyards are planted to myriad of different grapes that are uncommon to most of Bordeaux including Sauvignon Blanc, Semillon and Muscadelle, as well as Colombard, Mauzac, Merlot Blanc and Ugni Blanc. However, producers that make red wine, can sell their wine as either Sainte Foy Bordeaux, Cotes de Bordeaux, generic AOC Bordeaux or Bordeaux Superieur. Sainte Foy Liquoreux is the name sweet, white wines from the appellation are sold as. Sainte Foy Liquoreux are produced from grapes attacked by botrytis. For the best producers from Sainte Foy, look for wines from Chateau Hostens Picant, which makes wine that far exceed the lowly, difficult terroir of the region as well as from Chateau Martet, Chateau Carbonneau and Chateau du Champs les Treilles. The Bordeaux region is of course best known for its red wines. 90% of all Bordeaux wines are red. But as you can see, there is also a large amount of dry, white Bordeaux wine and sweet, white Bordeaux wine produced here as well. The production of sparkling Bordeaux wine and Bordeaux Rose’ is also allowed in three appellations which are covered below. Cremant de Bordeaux is the sole Bordeaux appellation that allows for the production of sparkling wine. Cremant de Bordeaux became an official Bordeaux appellation in 1990. 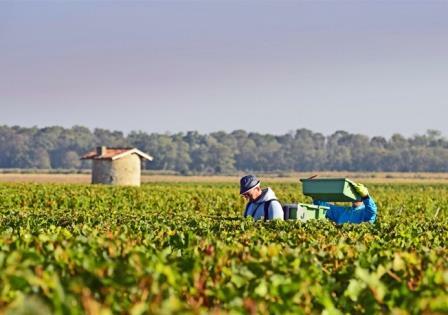 Close to 100 hectares are planted for the production of Cremant de Bordeaux. Traditional Bordeaux grapes are allowed for the use in the making of both, white Cremant de Bordeaux and rose’ Cremant de Bordeaux. Cremant de Bordeaux is almost always, the first appellation to start and finish picking during the harvest. Producers in Cremant de Bordeaux make their sparkling wine using the traditional Champagne method and techniques. AOC law insists on a minimum contact with lees of no less than 9 months. Cremant de Bordeaux must also be aged for a minimum of 12 months before they can be sold. Look for the sparkling Bordeaux wine made by Murielle Andraud and Jean Luc Thunevin of Valandraud, Bad Girl. While almost all producers making Cremant de Bordeaux produce wine using the Champagne method, a few estates make a rose’ styled sparkling wine from blends of Merlot and Cabernet Sauvignon. Bordeaux Clairet straddles the fence between a lighter rose’ and a full bodied Bordeaux wine. At least that’s the goal. Bordeaux Clairet is produced after the juice and grape skins have been in contact for days, giving the wine some color and depth. Bordeaux Clairet is also barrel aged for a longer period time than the rose’. In fact, up to 6 or even months, or even a few months more aging is normal. Bordeaux Clairet are most often produced using the saignee method, which means, that after the berries are pressed and the juice has remained in contact with skins for a few days and up to a week, the vats are bled to allow the lighter juice to freely run and is culled from the finished product. This allows the main wine to develop more color and concentration and creates what we know of as Bordeaux Clairet. 925 hectares are used to produce Bordeaux Clairet. The name of the appellation designation takes its inspiration from the color of the wines that Bordeaux produced several hundred years ago, when they first began to gain popularity in England, earning the wines the nickname of Claret. Claret is thought to be a shortening of what the wines were really called at the time which was clear red. This hommage later became known as Bordeaux Clairet. Look for wines from Clos Dubreuil, Prince de la Rivere, Les Bertrands and Chateau de Haux. 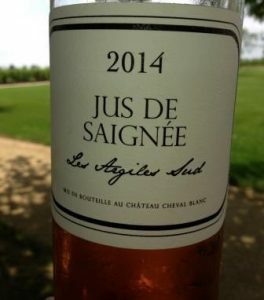 Bordeaux Rose’ It’s quite surprising for people outside of the Bordeaux appellation to discover that the majority of Bordeaux Chateaux produce small amounts of rose’ styled wines. The wines are meant for early drinking on a hot summer day, often by the pickers. Many of these wines are not sold commercially, but a few are released in small quantities. Still, it’s a bit of a surprise the first time you see a bottle of Cheval Blanc or Ausone rose’! The main difference between Bordeaux rose’ and Bordeaux Clairet is that the rose’ is a much lighter style of wine and sees at most, a few hours of skin contact. Bordeaux Adjacent Appellations: The following appellations are what I call Bordeaux adjacent appellations. They are quite close to Bordeaux and many vineyards are located just due east of Bordeaux. They are so close in some parts as to be not more than 15 kilometers away. They share similar terroirs, the same grape varietals, climates and wine making techniques that are used in Bordeaux. There are some Bordeaux chateau owners that also have vines planted in the Southwest France regions. Cotes de Bergerac has a long history in the southwest France wine region that started when it was first cultivated by the ancient Romans. The Cotes de Bergerac appellation was created in 1936. The Cotes de Bergerac is massive region with close to 12,000 hectares under vine. Bergerac is located due east of the city of Bordeaux and not far from the Right Bank of Bordeaux, with its nearest famous neighbors being Cotes de Castillon and Entre Deux Mers. In total, 93 different communes are part of the appellation, which is even better known because it houses the center of the Perigord region, which is famous for French, black truffles and foie gras. The large Cotes de Bergerac appellation actually consists or 13 separate appellations that allow for the production of red wine, dry white wine, sweet white wine and rose’. For the production of red wine, the dominant grapes are similar to what you find in the Right Bank, with high percentages of Merlot and Cabernet Franc. Due to the large size of the appellation, which naturally leads to wide variances in soil type and micro climates, the grapes allowed for the production of white wine is quite large. As you would expect, Sauvignon Blanc, Semillon and Muscadelle are the most important grape varietals. But you can also find oddities like Merlot Blanc, Ondec, Ugni Blanc and believe it or not, small amounts of Chenin Blanc are also planted in Cotes de Bergerac! Look for wines from Chateau Frinou, Chateau Calabre and Chateau Thenac, which is worth seeking out. Cotes de Montravel is a part of the larger Bergerac appellation. Cotes de Montravel only allows for the production of sweet, white wine that must be made from grapes attacked by botrytis. The terroir of Cotes de Montravel is limestone, clay and gravel. Red wines and dry white wine are also produced here. Look for wines from Chateau Calabre and Vignobles Dubard. Haut Montravel is part of the much bigger Bergerac appellation. AOC law states that only sweet, whitewine can be produced in the Haut Montravel appellation. Due to its proximity to the river, the necessary, foggy, mornings are perfect for the development of botrytis. The terroir of Haut Montravel is mostly limestone, clay and sandy soils. Most of the production of Haut Montravel is sold to locals in the region as well as in the south west of France. Look for wines from Chateau Puy Servain, Domaine de Mayat and Chateau Haut Sarthes. Montravel is a part of the much larger Bergerac appellation. While the appellation of Montravel was created in 1937, it took until 2001, before AOC laws allowed for the production of dry red wine, along with dry, white Bordeaux wine in the Montravel appellation. Montravel is not all that far from St. Emilion, in fact, it’s only 16 kilometers due east of the picturesque village. This is why you see so much of the terroir that resembles its Right Bank cousin, due to its limestone, clay and gravel soils. Look for wines from Chateau Puy Servain, Chateau Calabre and Chateau Le Bondieu. Pecharmant was created as an official appellation in 1992. Previously, the vines were part of the Rosette appellation, which is now dedicated to only making white wine. In Pecharmant, only red wine is produced using typical Bordeaux grapes, dominated by Merlot. Pecharmant is part of the larger Bergerac appellation. The name can be loosely translated into charming hills, which aptly describes its topography. The tiny appellation consists of 4 communes with a terroir of gravel and clay soils. Look for wines from Domaine des Costes, Chateau de Tiregand and Chateau Corbiac. Rosette is a part of the larger Bergerac appellation. The only wine allowed to be produced in Rosette is sweet, white wine. The terroir is mostly sand, gravel and clay. The Rosette appellation is quite small and only 10 growers at this point are making wine with the Rosette appellation designation. Red wine and dry white wine can produced here as well. Little known, most of the production is sold to local residents and others in southwest France. Saussignac is a small appellation that is part of the larger Bergerac appellation. The Saussignac appellation consists of 4 communes. The only wine allowed to be produced in the Saussignac appellation is sweet, white Bordeaux wine. The terroir is clay and limestone soils. The wines, which are the product of noble rot are made from primarily Semillon, Sauvignon Blanc and Muscadelle. AOC laws forbid mechanical harvesting and the use of Chaptalization to increase sugar levels. Producers in the appellation have the choice as to how they wish to label their wines. As they are part of the Bergerac appellation, chateau have the right to sell their wines as Bergerac, Cotes de Bergerac or Saussignac. Red wines from the appellation are sold as Bergerac. Look for wines from Chateau Billot, Chateau Richard and Chateau Miaudoux.